The rubric’s primary intention is to help re-humanize education and its evaluation by identifying and supporting the natural processes by which we as human beings learn. The Learning Journey Rubric is a framework originally designed to support a deeper engagement with the Values in World Thought program that I have been conducting with 11th and 12th grade students in for nearly two decades. In the Values program we explore concepts and practices that help develop self-awareness and contribute to the students’ ability to think ethically and creatively. Through study, dialogue, activities and reflection I encourage my students to explore the values and practices that contribute to a meaningful life. It is my experience that this process supports the development of the caring and engaged citizens that our communities and the world most need. The Learning Journey Rubric is also intended to further a discussion of a different kind of assessment process that allows for more meaningful evaluation of personal growth, creative capacities and discriminative awareness. The rubric’s primary intention is to help re-humanize education and its evaluation by identifying and supporting the natural processes by which we as human beings learn. My hope is that this Learning Journey Rubric will stimulate a conversation on how we can better engage questions of values, ethics and meaning in today’s classrooms. These are not easy subjects to integrate into our curriculums but without them our educational system is incomplete. Schooling is an important and formative part of the learning journey of life, and I believe it is essential that our schools provide the tools to help our young people connect with their own creative capacities and allow them to discover new possibilities in the complex challenges that face or communities. The goal of the Learning Journey Rubric is not to spell out any specific set of values to be instilled. It is to explore processes that will help young people, as Robert Inchausti wrote above, understand and evaluate the concepts and ideas though which they interpret their experiences. It is also designed to encourage them to examine critically the values by which they make choices and set goals. It is undoubtedly important that we provide information and knowledge to our youth for their success in life, but unless we also attend to values, character, discernment and creativity we run the risk of leaving our students without the ability to navigate the complex challenges that inevitably arise. In the interdependent world in which we all live, this has great consequence, not only to the individual but also to our communities and our environment. Rather than reacting to our circumstances with judgment or a rigid set of rules, we must develop our ability to respond with curiosity and creativity, utilizing our awareness of what is important. We have learned a lot over the years about engaging a discussion of values in the educational process. As mentioned above, we are aware that values cannot be treated as objects or rules to be imposed on our students. Values are dynamic principles that work in relationship with each other and always within a context. This means as that as we engage in the values conversation we must develop the capacity of discernment or discrimination to understand not only what our values are, but also how those values are applied in a wide variety of complex situations. It also means that we must develop the capacity to critically question what we see as accepted practices and develop our capacities to engage creatively with the complexities of life. Rather than reacting to our circumstances with judgment or a rigid set of rules, we must develop our ability to respond with curiosity and creativity utilizing our awareness of what is most important. We create our world by what we choose to notice. The Values in World Thought program has its roots in a gift from my mother in 1989 that changed the course of my teaching life. Her gift was the video series of Bill Moyer’s ground-breaking interviews with anthropologist Joseph Campbell called the Power of Myth. These interviews took place at George Lucas’s Skywalker Ranch in California shortly before Mr. Campbell passed away. Little did I realize at the time that her gift would eventually lead me to direct contact with Mr. Moyers and provide for a remarkable range of experiences including interviews that took us as far away as India to interview the Dalai Lama, and full circle, 22 years later to an interview with George Lucas and a visit to that same library at Skywalker Ranch where the interviews with Joseph Campbell first took place. The Power of Myth Series was an exploration of the life work of Joseph Campbell who studied the major religions and mythologies of the world to discover the essential truths of the human experience they held in common. This universal approach to understanding the core strivings of humanity had a magnetic appeal for me, and the idea that each person’s life matters and can be infused with the mythic power of the “hero’s journey” was compelling. Because of the impact of the Power of Myth series I was attracted to Mr. Moyer’s later series called A World of Ideas. These insightful interviews with luminaries across the spectrum of human endeavor opened up many doors to my thinking. When I began to explore these concepts in an Elder Hostel program I conducted during one summer, I discovered that the questions Mr. Moyers explored in his interviews had a universal appeal. After encouraging successes with adults in Elder Hostel I became curious about how my 11th and 12th grade students might respond to these same themes and decided to select a number of the World of Ideas interviews as the basis for a curriculum in my high school English course. This was the beginning of the Values in World Thought program. Initially, while wanting to explore the important concepts brought forth in Mr. Moyers insightful interviews, I was well aware of the need to anchor the Values course in a series of proven academic goals such as vocabulary building, critical thinking, critical writing, and speaking. Consequently I began the course using many of the traditional practices and measurements that were consistent with an English course that combined personal and social issues with cognitive skills. Since those early days, as the class evolved, I never found time to formally reconsider or add to these traditional frameworks for evaluating student progress. However, as the years went by I noticed that I was gradually moving away from those initial standards of measurement as they did not seem to address some of the most important outcomes of the Values program. I knew we needed a different kind of assessment process for the evaluation of personal growth, creative capacities and discriminative awareness. Recently in 2007, during our participation in a collaborative project with the Dalai Lama Foundation called Project Happiness, I was impressed by the “rubric” created by the project leaders to measure “emotional well being” and it dawned on me that it might be possible to set up a more effective framework for evaluating the Values course. I began thinking in earnest about ways in which we might more clearly define our goals and effectively measure students’ progress in the program. This rubric then, is an invitation to join the conversation, so that as we engage in our various educational subject areas, we can find ways to support the development of caring and creative human beings capable of thoughtful and responsible action. In late fall of 2008 I began a discussion with my senior class about creating a rubric for the Values in World Thought class, which led to several weeks of dialogue regarding the intentions and results of the class and how they might be measured. I wanted student collaboration to verify that the rubric accurately reflected their experiences in the program. What has evolved is still a work in progress. None the less, I feel it is important to present this Learning Journey Rubric to encourage further discussion and evolution of these ideas in the hope that together we might find ways to help reshape some of our educational processes and goals. This rubric then, is an invitation to join a conversation so that as we engage in our various educational subject areas, we can find ways to support the development of caring and creative human beings capable of thoughtful and responsible action. If learning and change are truly our intent, a slower, more demanding, and more deliberative approach is required. We have to value struggle over prescription, questions over answers, tension over comfort, and capacities over needs and deficiencies. The intention here is to create a different learning narrative that allows the students to reflect on their own process of engagement and evaluate their own experience. We believe that the natural human response to “not knowing” should be curiosity rather than shame or a sense or insufficiency. This is the preparatory or conceptual learning stage. Rather than looking at the initial state of “not knowing” as “unsatisfactory,” we begin with the awareness that we have to start the learning journey from where we are. This is not an unsatisfactory state as much as it is a beginning in stage from which we are called into learning. We believe that the natural human response to “not knowing” should be curiosity rather than shame or a sense or insufficiency. What skills are useful in shaping my understanding of the world and supportive of my capacity to draw deeper meaning as I engage in life experiences? What is my capacity to sort out the complexities of life and respond with curiosity and creativity? Do I have caring and reciprocal relationships at various level of my life? Are my actions consistent with my values? At the “Call” or preparatory stage we are learning new vocabulary as well as new process skills and concepts that will be useful for the journey. We are also evaluating ourselves at the starting point without making judgments about our current state. Rather we reflect on our current state in order to become aware of what new skills and concepts we need to acquire that will be useful on the journey. At this stage traditional evaluation standards can be employed to provide short-term indicators of how we are doing in relation to our immediate learning goals. The utility is that they provide immediate feedback for a larger process that the student cannot yet see. However, there is a risk that we will continue to reinforce a process that does not allow or encourage the student to self-evaluate or take ownership over their learning process. This is one of the key areas of exploration that the Learning Journey Rubric takes on. This preparatory stage is not just academic exercise. It is also mental preparation for experiences that will call forth skills and elements of the student’s character that will be essential to the success of journey. In this way the Learning Journey Rubric reflects an evaluation process that is consistent with the larger life journey. Questions in the Call stage include, What matters to me? What values do I hold and where might they come from? What are useful strategies as I engage with the journey? How meaningful and experience do I intend to have? What is my commitment to this part of the journey of life? What skills do I need or want to develop for what is coming? This is the experiential, or in education parlance, the “affective” learning stage. In our Values in World Thought course it often involves and actual journey to explore new and unfamiliar territory. For example, every other year we go to Washington, D.C. for 10 days to interview government and non-government leaders. On alternate years we have taken trips to a variety of places like New York, Boston, India, Ecuador and South Africa. These learning journeys allow the students to utilize the skills and concepts of the preparatory stage on the journey. In the many interviews we conduct, the ideas and concepts discussed in the first stage become the source of questions in the interviews, while the cognitive, critical thinking and writing skills become an active part of the reflection process as the journey unfolds. This experiential or “affective” learning aspect of the class mirrors the life process in that whatever skill sets we develop they are eventually tested in our life experiences, at which point we can reflect, evaluate, and make the adjustments we deem appropriate as our journey unfolds. There are many ways to engage in the experiential learning process besides a physical journey. Projects, local engagement, classroom interviews, community service are all well proven methods. The questions of the “journey” stage of the rubric help to bring the learning to the surface where the students can reflect and witness each other. I have been surprised to see that the students naturally gravitate to the discussions of the journey stage. When I inquired about this they informed me that they this helped them to integrate and reflect on their emotions and understand the experiences and emotions of others in the group. We know that when emotion is involved the learning experience is deepened. When the students are actually engaged in the experience there is less of a buffer between them and the journey. What was abstract in the “preparation” phase is real in the “journey” phase. There is a greater openness and sense of shared project. Not only does it help the students become more aware of their experiences, but it also bonds the group as they begin to understand how others are also learning and feeling in the process. In short we are discovering that experiential and emotional learning go hand in hand. The questions of the “journey” stage of the rubric help to bring the learning to the surface where the students can reflect and witness each other. Often this is a phase of the learning journey that is neglected or left out altogether in our educational system. The “return” is the integration phase of the learning journey. It is the stage where students are witnessed as they give expression to what they have learned in the first two stages. Sobonfu Some, author and indigenous wisdom carrier from Western Africa has said that unless one is welcomed back from a rite of passage by the village, the initiatory process will be incomplete. From the indigenous perspective incomplete initiation brings a sense of isolation, alienation and even depression. This makes reintegration to the community difficult. As we have discussed the learning Journey concept with others we have discovered that many have experienced this sense of incompleteness at some point in their lives. Often our students remark that returning home is the most challenging part of the journey. When they speak of their experiences they find that it is hard to fully describe their feelings and convey the emotional learning and growth they experienced on the journey. 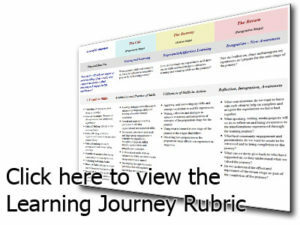 The Learning Journey Rubric contains a series of questions and processes designed to help integrate the experiences of the students and bring completion to the journey. We are discovering that there are several stages to the return phase of the journey. In the initial phase of the return, often a student experiences a sense of loss. The close community that has formed on the journey has disbanded. There is a return to the daily life they knew before, but daily life is not experienced in the same way. In telling the story of the journey, even to family and friends, there is a limit to willingness to listen that does not fully satisfy the student’s need to communicate and explore the feelings connected with the journey. I have been surprised when addressing the questions of the “return” stage of the rubric, how concentrated the student become. Some of the students have mentioned that they needed to process what happened on the journey with those who shared the experience in order to feel truly understood. They have also remarked that in answering the questions of the “return” phase they become more aware of how they have evolved in the process of the journey. Answering the questions brings back a sense of shared experience and also allows the students to witness each other and how they have grown. It is also important for the community show their willingness to learn from the new awareness that the students bring back as a result of their experiences. The second major phase of the return has been, as Sobonfu Some described it, “A welcoming by the village.” For this stage we set up an assembly where families, friends and member of the school community come to listen to the students talk about their journey. A common result of these gatherings is that those who come are struck by the transformation of the students and see them in a new and more mature light as the students articulate what they have learned. This part of the process allows the community to witness the transformation of the students and it allows the students to see that the community is interested and impacted. Often it means a lot for the students to see the enthusiastic and sometimes emotional response of those assembled as the students speak of their experiences. Parents who may have taken their own child’s learning in stride hear something more in the context of the larger gathering and are often surprised and moved at what the their childrens’ classmates have to say. The third aspect of the return stage, which is intertwined with the first two stages of the return is the students engagement in a variety of projects use many different creative disciplines such as group process, dialogue, journal writing, web logs, photo and video projects as a way of documenting and reflecting on their experiences. If we truly care about what the students are actually learning, then part of the process must be to ask them to honestly self-reflect and reveal what they have learned rather than create objective measurement standards. It is my observation that the “return” phase takes into account a natural human response to learning, which have to do with reflection, evaluation, sharing and being witnessed by others. If we truly care about what the students are actually learning, then part of the process must be to ask them to honestly self-reflect and reveal what they have learned rather than create objective measurement standards that demand that they have learned what we have decided they will learn. If we predetermine what they should learn rather than witness what they have learned we actually devalue their capacities and gifts. In this context learning is shut down and the students begin to perform rather than learn. The “Return” phase of the “rubric” encourages us to be curious rather than judgmental about the students learning process. We look forward to your thoughts and contributions and adaptations to the Learning Journey Rubric as it is not designed as a product to be sold but rather a process to be explored and adapted.